The LG 360 VR is not where mobile VR is heading. It's not immersive, it only works with one phone (for now) and it's too expensive. 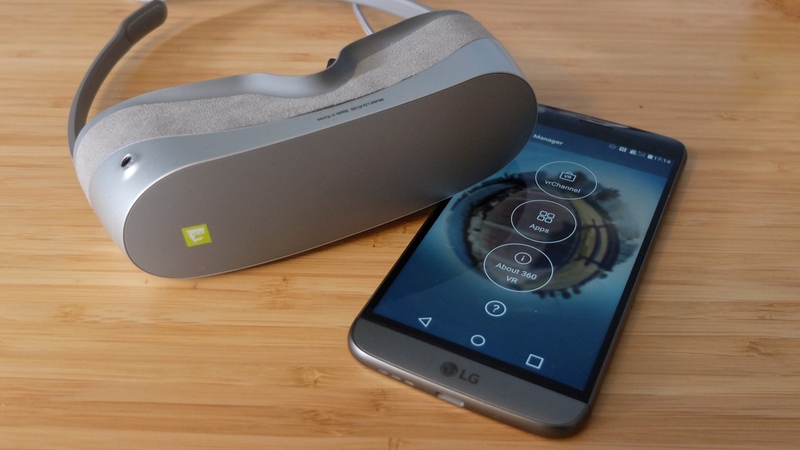 Last year, LG joined the Google Cardboard fun when it unveiled its own plastic headset called VR for G3. Made specifically for LG G3 smartphones, it was given away with each G3 purchase. Then it all but disappeared into the ether. This $240 pair of goggles, which works with the LG's current flagship the G5, though not quite in the way you'd expect if you've used a mobile VR headset, looks set to join it. If you're familiar with the setup of the Samsung Gear VR - using a handset to power up a VR experience, then you'll get the gist of LG's latest device. However there's a huge difference between the two: the LG 360 VR doesn't require a phone to sit in front of your face. Rather, the headset plugs into LG G5 handsets via a dedicated USB-C cord. Only new(ish) flagship Samsung phones work with the Gear VR and, you guessed it, only an LG G5 will work with the new LG headset. LG reps have told us that it does want to let other handsets work with the goggles in the future though, but we don't know a timeframe for that. The 360 VR goggles weigh only 118g (about a third of the Gear VR) and the fact that it's light and fairly comfortable is one of the only things working in its favour. Though a bit awkward to put on at first - the goggle legs have to be pulled outward to place on your face - it was noticeably well, unnoticeable, because of its lack of heft. Plus you don't get the weight of it on your nose and the tops of your cheeks as you do with heavier headsets. The fact that it's foldable and slimmer than other mobile headsets could make it appealing for using on a plane, say, though we are starting to see fold up Cardboard viewers which will be more portable and a lot cheaper. The main downside to the 360 VR's build is that various models we have used also felt a bit like it would fall apart if we knocked it about too much. Then there's also the fact that in three directions you can see the room around you. The lenses are adjustable similar to the Gear VR's diopter but also like Sammy's headset, the LG 360 VR isn't good for glasses wearers. The nose pad, however, can be removed and replaced with better fitting pair. There's also a cover or "light shield" that forms to your face and can be switched out. The cord does sit in an odd place on the right side of the goggles. Instead of being underneath the goggle, it's secured on top. It's annoying to hear, and feel it when you're moving around especially when you're used to completely wireless Gear VR and Cardboard experiences. Add wired headphones and you could end up in a Rift/Vive-style tangle but without the high end experience. LG claims that using the 360 VR is like watching a 130-inch TV from 2 metres away. Not quite, LG, not quite. In fact, it's doesn't compete with Gear VR - or even Cardboard - in terms of immersiveness. Picture quality is nothing special, despite the fact it has its own dedicated display rather than using your phone's and it doesn't look like watching a private, big screen TV either. The built-in LCD IPS display serves up 960 x 720 pixels per eye (that's lower than a Gear VR with a Galaxy S7) and there's a proximity sensor, a six axis accelerometer and a gyroscope for head tracking. The main reason this just didn't work for us was that we could see too much of the real world from the bottom of the goggles. It's just not "360" and very cheap and light Cardboard viewers are able to enclose our vision better than this. Yes, it does mean you can check your phone but hey, your phone is your touchpad and I was able to use this without looking anyway. It's a bizarre hybrid of VR lite and looking down at your own real body and surroundings - it makes you kind of stop paying attention to what's on screen. Perhaps because of the low resolution and a bit of a buggy display, we actually got slightly more motion sickness with the 360 VR than probably any other VR device we've tried. Now I get motion sickness a little, but it tends to be when I've been inside a headset for 20 minutes, here I got it after about two minutes, on the rollercoaster demo. Not pleasant. Part of the VR experience is what you can do on it and so far, here, that means not a lot. There's Jaunt's app and YouTube but the rest of the apps (NextVR, Epiq VR, SBS Player) aren't even available yet. According to LG, all Google Cardboard apps are compatible but we didn't have any luck getting any to work with the 360 VR. Here's hoping that's awaiting a firmware update because that will really beef up what you can experience on the 360 VR. So how is it in use? This is not a great experience overall but there's actually some good ideas here. We liked the adjustable lenses, even if it didn't work perfectly, and the phone-as-touchpad for any headsets that don't use the phone's display. It also doesn't have the steaming up problem that the Gear VR suffers from, perhaps because your eye area isn't actually enclosed. Alerts are handled well enough - they just pop up in your eyeline, though we did have trouble getting one to disappear since the G5 had turned into a blank screened touchpad at this point. As well as using your phone, there are two buttons on the top right side - back and "OK" - which let you navigate the VR interface and work just fine. The problems really do continue, though. We found that the G5 tended to heat up in our hand after about five minutes of use, and the battery drained fairly quickly too. Still, the 360 VR unit itself didn't heat up. It’s shame that we’re testing the 360 VR just after Google has outlined its bold vision for its Android-powered VR platform, Daydream, of which LG is a smartphone partner. The only people who should consider buying the 360 VR are G5 owners. If you’re one of them, save yourself a lot of money and get a decent Cardboard viewer while you wait for Daydream ready phones and headsets to launch this autumn.